Design is the name of the game with this quiet book page. 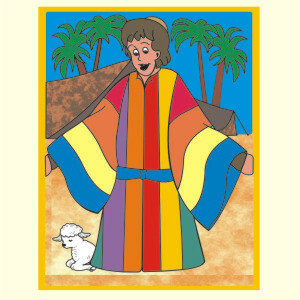 Your child has the opportunity to design the coat for Joseph who was sold into Egypt. Each coat is made of four large, easy to handle pieces which store in a pocket when not in use. With 20 coat pieces, creativity is more than encouraged. To add to the fun we have included 16 Dress-Me Up cards which challenge your child to dress Joseph as he is dressed on each card. A great teacher of shape matching and like-design recognition. Appropriate for toddler aged children. This fastens into one page of the Take-A-Long Tote.